I will present that project at the Embedded Computing Conference 2018 (June 5th), both in a conference talk and have the machine in the exhibition area. The machine is based on OpenPnP framework, and is not finished yet, and I have published status updates on Twitter. It uses mostly standard components, special parts have been 3D printed or produced with a laser cutter. Below a picture with the controller and LCD board, stepper motor drivers, power supply and diaphragm pump. 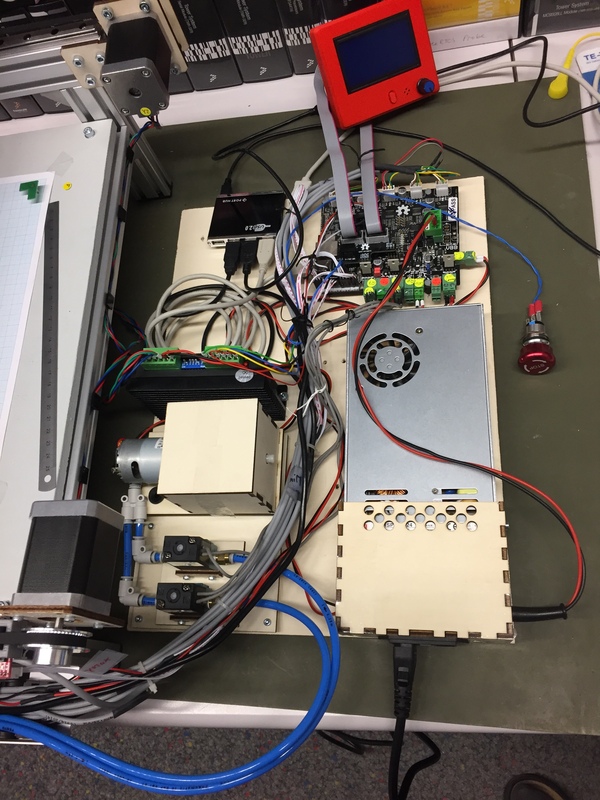 The machine runs G-code with NXP LPC ARM 1769 Cortex-M3 microcontroller. Additionally feeders are controlled by several NXP Kinetis K20 an K22 controllers. The machine is not intended to be very fast or the least expensive one. The goal is to have a reliable, flexible and user-friendly pick and place machine, which can be used to produce smaller batches of boards (1-50 boards). The speed of the machine has not been optimized yet as the first priority is to get accurate SMD component placement. Currently the machine is able to place around 400 components/h. The motorized tape feeder is work in progress by a student contributing to that project. The feeders use NXP Kinetis K20 and K22 microcontroller (ARM Cortex-M4 running FreeRTOS with Processor Expert). Another subproject (not started yet) is to add a solder dispensing option. The video below shows how the board (PCB) fiducial markers are used to find the board origin position alignment. All what I have to do is to place the board ‘near’ the origin, and the machine will adjust the SMD component based on the fiducial markers. I have configured the system to average three measurements. The LED rings for the cameras are used for only a short time (flash 3 times for each fiducial marker). Because the original board did not had fiducial markers on it, they have been added to the board later. Would this something you could consider to have on your desk or in your lab? Clearly, for more than 40-50 boards I send them to an external assembly place. But for less than that, for all the prototype stages with a handful boards, or for a classroom setup with 30-40 boards? I can get 10×10 cm dual layer boards from China for a total of $5 (plus shipping) in less than a week. The hard work is to get them assembled, or it is expensive to have them assembled by a contracting house. That machine fills that gap. So what do you think? PS: I plan to write-up more articles about the machine (how-to, BOM, …) with more videos and pictures. This entry was posted in 3D Printing, ARM, Boards, Building, CPU's, Embedded, FreeRTOS, Kinetis, Laser, Laser Cutter, LPC, LPC, NXP, OpenPnP, Pick&Place, Processor Expert, Robots and tagged Building, FreeRTOS, Kinetis, LPC, NXP, open source projects, OpenPnP, Pick&Place, PnP, Processor Expert, Robots, technology by Erich Styger. Bookmark the permalink. Erich: “I am not worthy!” 🙂 That’s an amazing (and ambitious) project! I’m just prepping some boards for third party assembly, so pick and place is a timely topic. One question: in the middle video (iterating through components), the x/y crosshairs for C4 (at t=0’17”) seems rather low. Was that expected? Yes, I had noticed that offset for C4 as well. The reason is that the fiducials are not 100% correct (they have been placed manually). That caused some offsets for components placed furhter away from the 0/0 origin. The other thing I suspect is some mm/mil conversion rounding in KiCAD (still to be confirmed). thanks for sharing that page/link! Yes, we looked at this approach, but have choosen to use pull the tape on a reel. Have to see how well this will work. Pingback: DIY SMT Pick-n-Place Sneak Preview | #OpenPnP « Adafruit Industries – Makers, hackers, artists, designers and engineers! What vacuum pump are you using? One of the pumps on our Chinese 2-head pick-and-place machine is going out and the pumps seem to have been discontinued. Domestic equivalents I’ve found have been really expensive. I’ll have to see if OpenPnP can be made to work with that machine… the original software is not great. 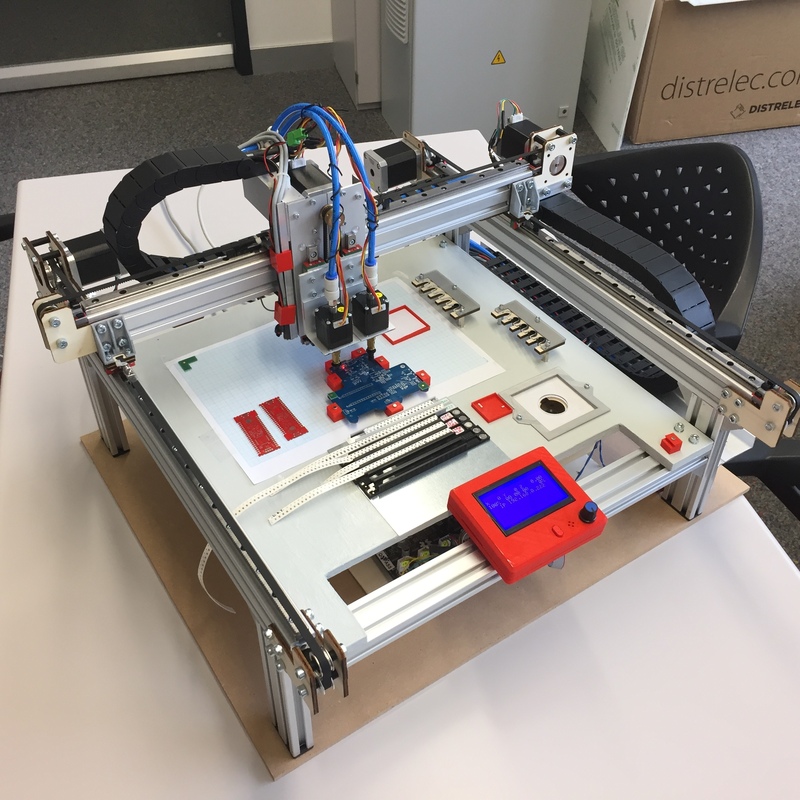 And if you’re looking for another DIY project that’s handy for prototyping, check out some of the UV flatbed printer conversion projects out there. We just got a Chinese-made printer that’s based on an Epson R330 print engine. It’s basically the guts of an R330 with a continuous ink feed system, an adjustable height flat bed, and a big water-cooled UV LED. It’s been fussy, but I’m really pleased with the results. We can print right on anodized aluminum enclosures in full color with basically no setup. Today, as an experiment, I printed new graphics on an IR remote control’s membrane keypad and it looks pretty good – probably good enough for low volume production with some adjustment of the printing parameters. The ink opacity is good enough that the original printing doesn’t show through at all. Our printer was about $2300 delivered, including ink, and I think you can get conversion kits for around half that. If you do any sort of short run production it’s a great way to make your projects look a lot more professional. I’ve also been going a little crazy printing on lighters, pens, coasters, acrylic cubes, my tape measure, shot glasses, and just about anything that will fit in the machine. I’m using the 24V Diaphragm pump from RobotDigg (https://www.robotdigg.com/product/599/Diaphragm-pump-4-desktop-PNP-Machine). They have other pumps in their store too. The software was *the* reason why I did not want to buy a commercial machine. I saw others in the openpnp community which are using openPnP for commercial machines. Basically using a Smoothieboard to control the servos and valves. Thanks, I’ll order one of those! It’s about 1/20th the price of the other pumps we were looking at.